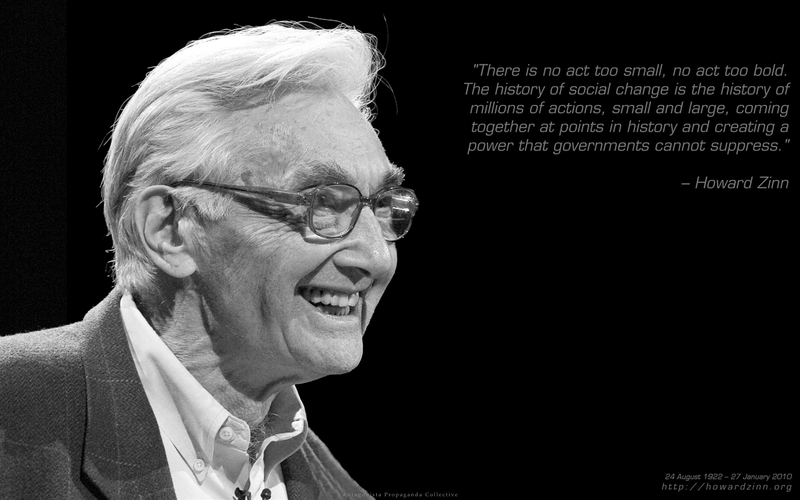 The Boston Globe has confirmed the death of Howard Zinn, the socialist historian and activist who wrote the brilliant People's History of the United States. He was 87. I think people are dazzled by Obama’s rhetoric, and that people ought to begin to understand that Obama is going to be a mediocre president — which means, in our time, a dangerous president — unless there is some national movement to push him in a better direction. From Howard Zinn's final article about the first year of the Obama presiodency, written for The Nation. I wanted students to leave my class not just better informed but more prepared to relinquish the safety of silence. Remember, there are some people who cannot be educated. They must be defeated. Historically, the most terrible things -war, genocide, and slavery - have resulted not from disobedience, but from obedience. Truth has a power of its own. Art has a power of its own. That age-old lesson – that everything we do matters – is the meaning of the people’s struggle here in the United States and everywhere. A poem can inspire a movement. A pamphlet can spark a revolution. Civil disobedience can arouse people and provoke us to think, when we organize with one another, when we get involved, when we stand up and speak out together, we can create a power no government can suppress. We live in a beautiful country. But people who have no respect for human life, freedom, or justice have taken it over. It is now up to all of us to take it back. Any humane and reasonable person must conclude that if the ends, however desireable, are uncertain and the means are horrible and certain, these means must not be employed. Civil disobedience is not our problem. Our problem is civil obedience. Our problem is that people all over the world have obeyed the dictates of leaders…and millions have been killed because of this obedience…Our problem is that people are obedient allover the world in the face of poverty and starvation and stupidity, and war, and cruelty. Our problem is that people are obedient while the jails are full of petty thieves… (and) the grand thieves are running the country. That’s our problem.